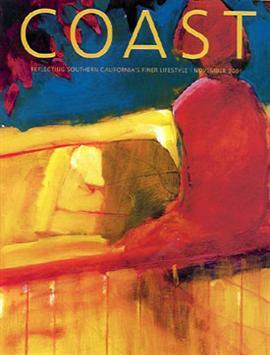 The following is from the November 2001 COAST Magazine article featuring a question and answer interview with founder and manager Miriam Smith of the Art Resource Group. My livelong passion has been art, and I am surrounded by exceptional works of art every day. I meet interesting people, and I am able to interact with talented, creative artists on an almost daily basis. Someone who appreciates creativity and wants to learn, explore and extend themselves beyond their comfort zone in art, and someone who values my advice. What personality traits make you great at what you do? Clients are drawn to my passion for art and my ability to translate my passion into reality for them. Art has its own visual and verbal vocabulary that can be intimidating, and I am able to put people at ease with the process of selection art that is pleasing to them and represents a good value. The result is they acquire works of art that have meaning to them and that they enjoy having in their homes or businesses. What has changed most about your business in the last year? I moved the business to Corona del Mar after being in Laguna Beach for 13 years. I am meeting so many new people and working more on residential projects, which is extremely satisfying to me. Do you prefer to be behind the scenes or out in front? I certainly enjoy interacting with people and talking with them about art, but I admit I prefer to be behind the scenes working with artists, curators, galleries, and auction houses to find the perfect piece to delight a client. I have been referred to as a "private eye" as I comb through my many resources to locate just the right piece of art to achieve this end. I always want to feel my clients are completely satisfied with what I've done for them and that I've been able to add both value and enjoyment to their lives. I travel all over the world to keep current on art trends and to discover works of art that don't always end up in traditional art circles. To enjoy my work and the people I work with, to feel good that my clients are satisfied, and to travel all over the world and still maintain an active business that materially contributes to other people's growth and enjoyment of their lives. I represent the client, not the artist. Even through I am perceived to be a gallery, the biggest difference is I don't maintain a "stable of artists" so I have the freedom to choose art from many different sources and can remain objective. My extensive knowledge of 19th- and 20th-century art, combined with my project management abilities, enables me to provide a complete service to my clients from concept to conclusion to insure its success. As Member of the Appraisers Association of America, I provide appraisal services for purposes such as insurance and IRS donation. Do you believe a person is defined by what he or she does for a living? Definitely. As for me personally, my passion for fine art and my appreciation of it has a direct influence on how I choose to expend my energy. Whether I'm walking through a jungle in New Guinea or strolling the aisles in a Parisian gallery, I am constantly energized by my environment. I am an artist myself, so I appreciate the process of creation as well as what is expressed in an artist's work. My sizeable library of art books attests to my never-ending search for knowledge. How would you like to be described by your customers? I would like them to say, "You'll love working with Miriam. She makes's a sincere effort to get to know you and understand your objectives in purchasing both traditional and contemporary art. You can be confident that in the process of expanding your horizons, she will find works of art that are interesting to you and represent a good value as well. She provides a truly remarkable service."